I recently spent almost two weeks on the lovely island of Kaua’i. My son and I relaxed, snorkeled, surfed, body boarded and enjoyed the beautiful sights of the island. 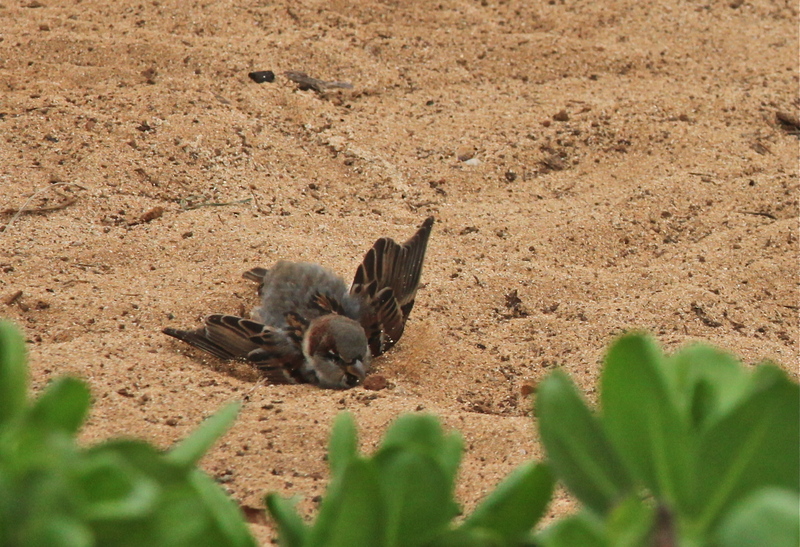 I enjoyed the birds on the island too. 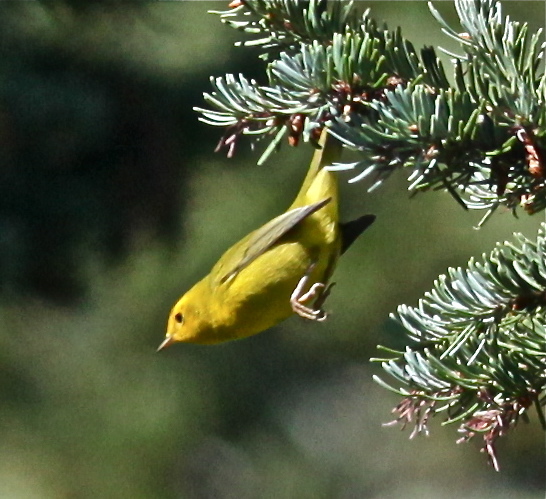 Here are the birds that I saw and photographed. 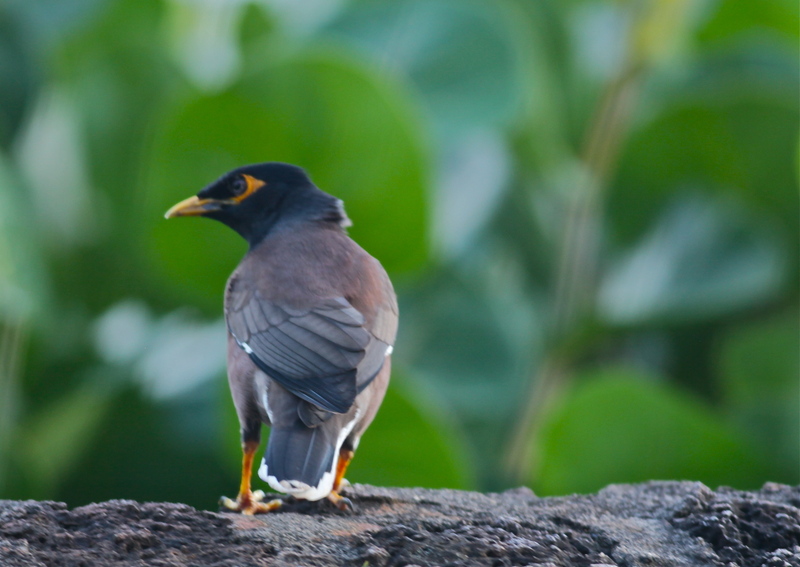 Common Myna (Acridotheres tristis), introduced in 1865, native to India. 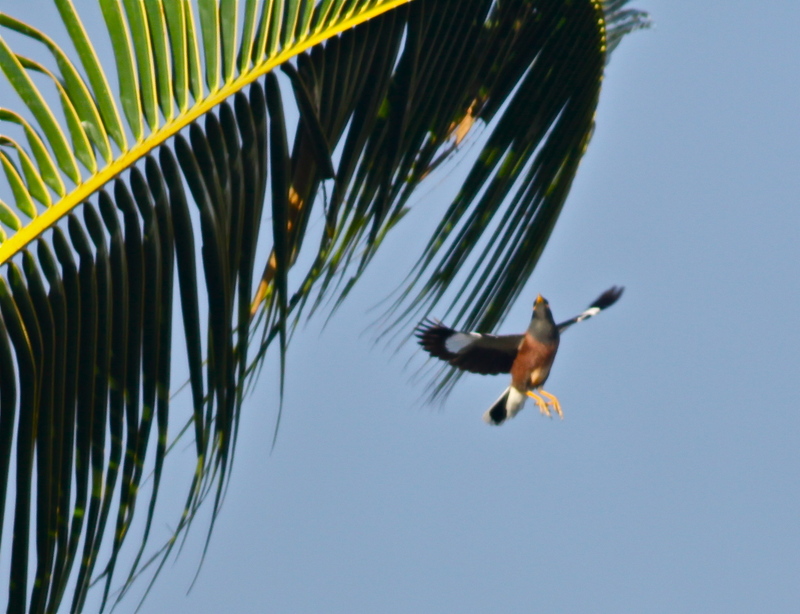 Common Myna flying in for a handout. 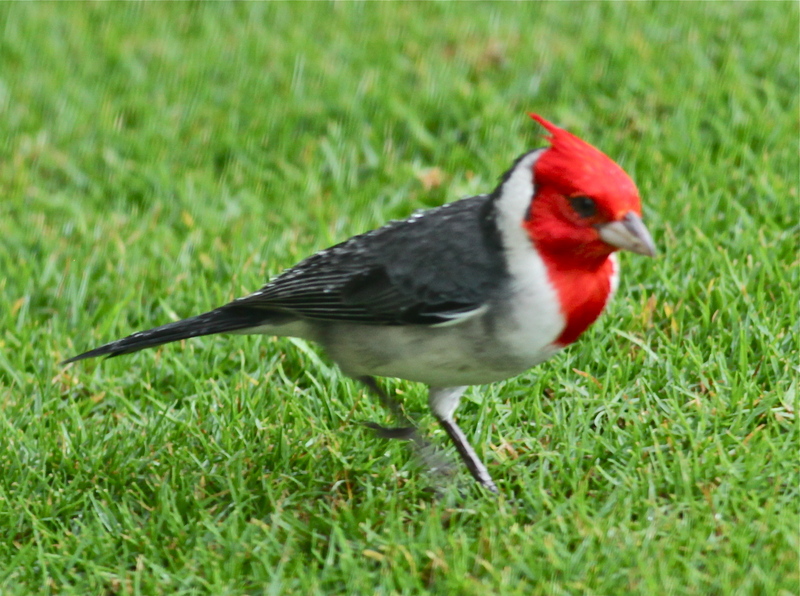 Red-crested Cardinal (paroaria coronata), introduced in the late 1920's, native to South America. 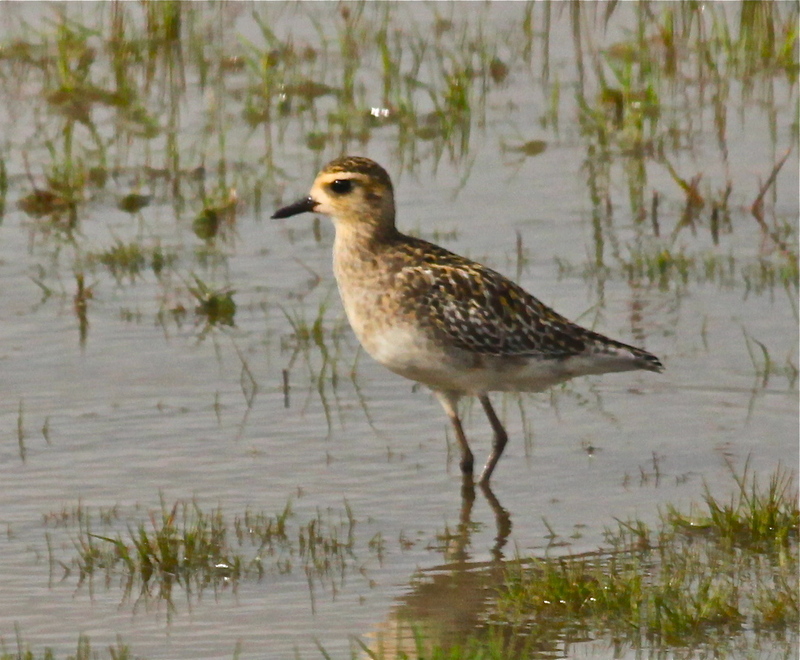 Pacific Golden Plover, Kolea (Pluvialis fulva), native non-breeding visitor. Zebra Doves (Geopilia striata), introduced in the 1920's, native to Southeast Asia. There were urban and golf course birds. 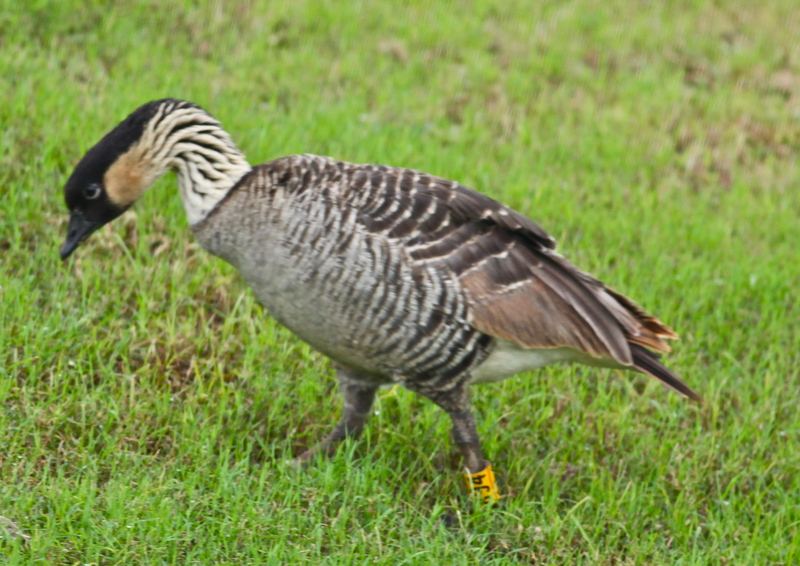 Nene (Branta sandwicencensis). 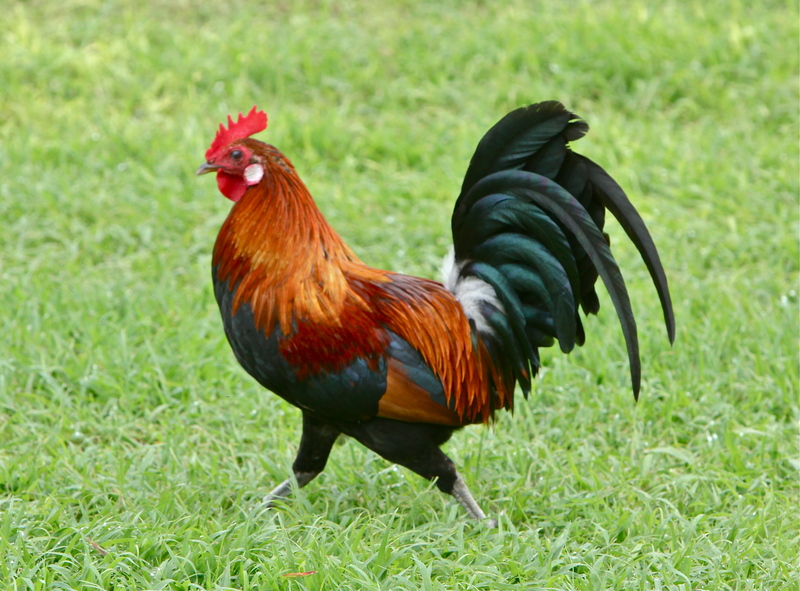 State bird of Hawai'i. 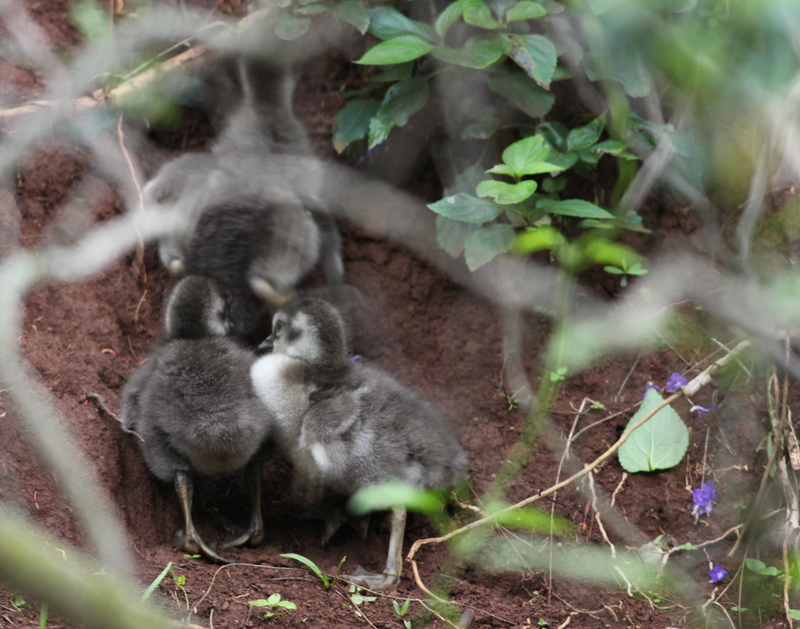 Nene chicks, Kilauea National Wildlife Refuge, Kauai, Hawaii. 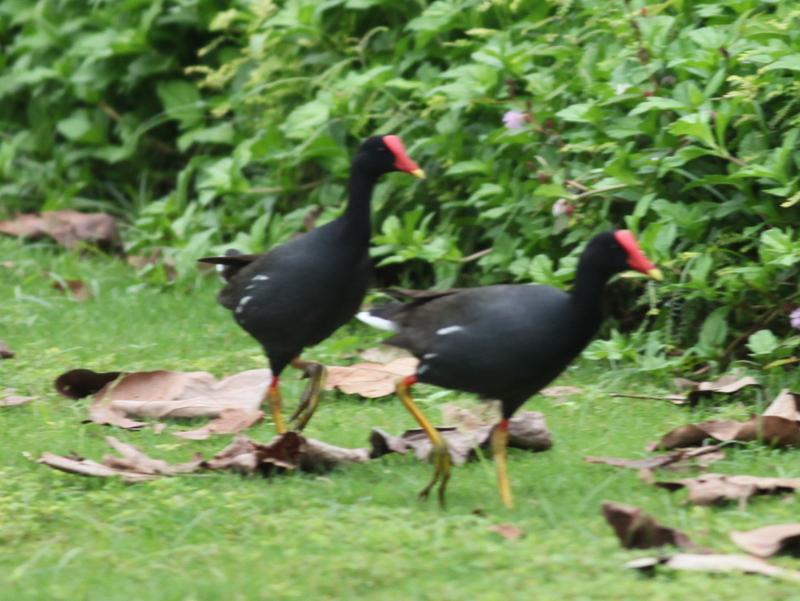 Common Moorhen, 'Alae 'ula (Gallinula chloropus) Native Hawai'ian subspecies. House Sparrow (Passer domesticus) Introduced in late 1800's, native to Europe, Middle East. 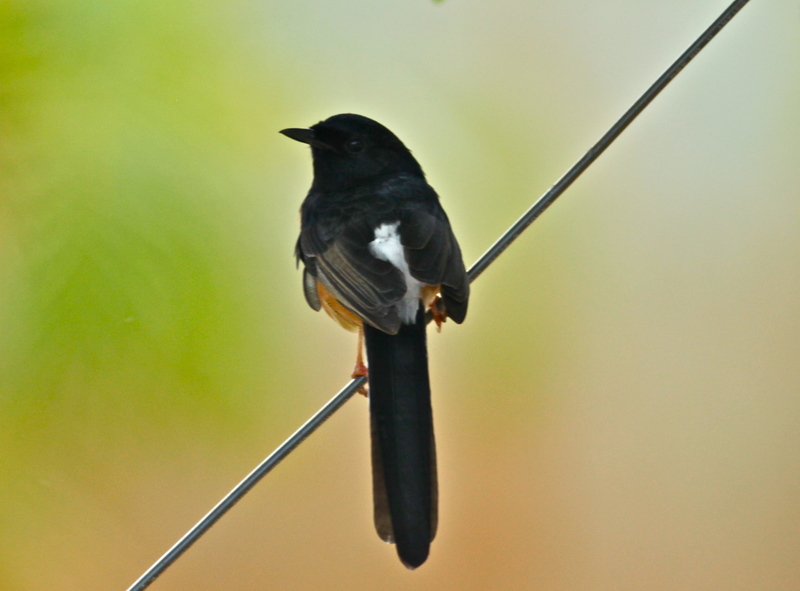 White-rumped Shama (Copsychus malabaricus), introduced in 1931, native to Southeast Asia. 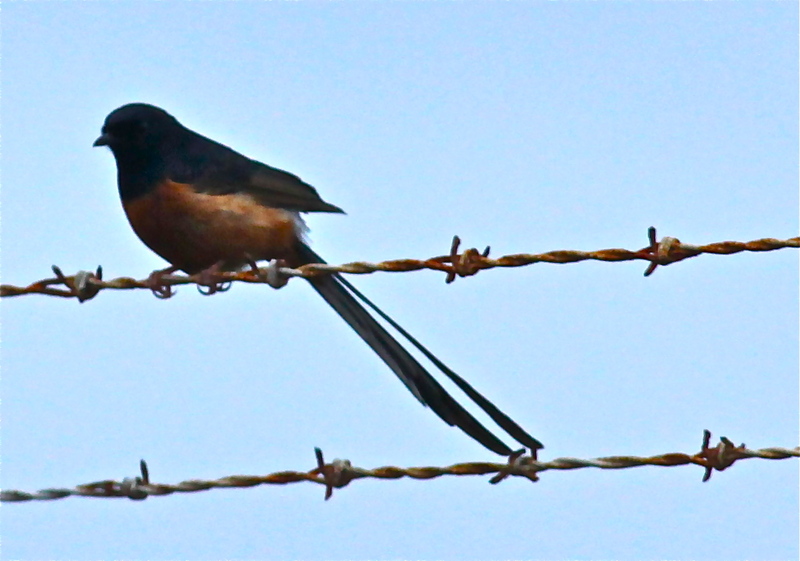 White-rumped Shama near the Lihue airport. 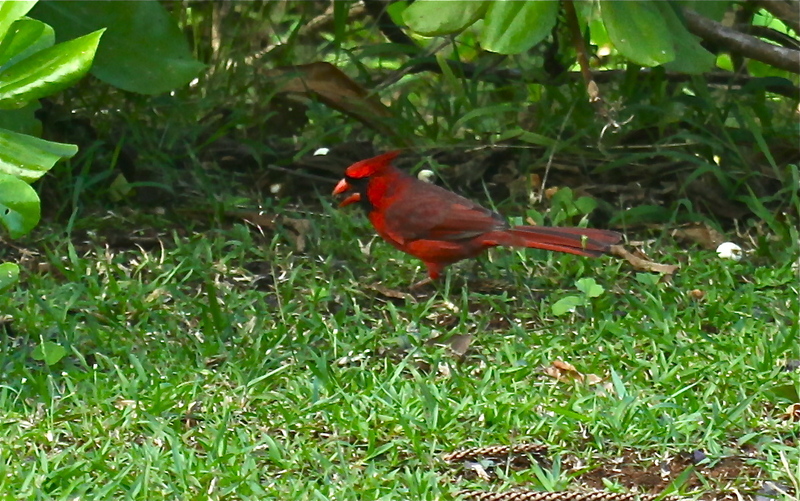 Northern Cardinal (Cardinalis Cardinalis), introduced in the late 1920's, native to North America. 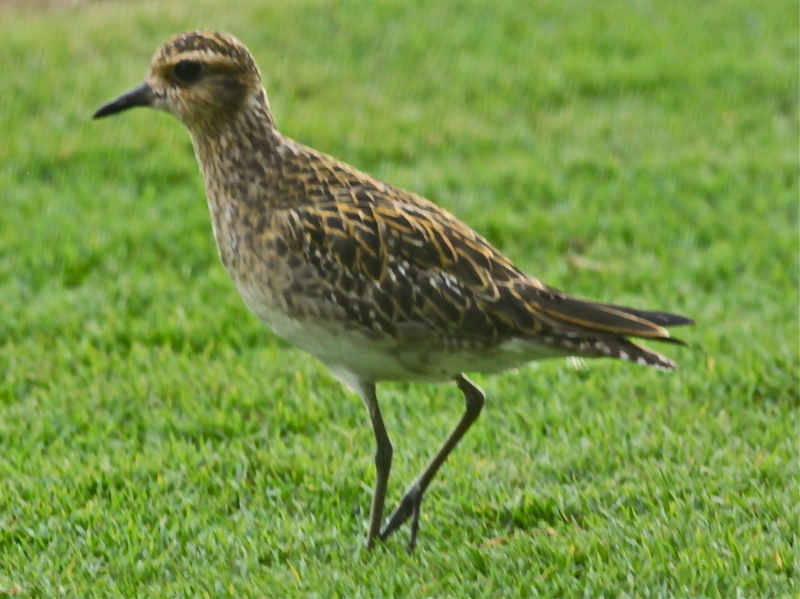 Pacific Golden Plover, Kolea, (Pluvialis fulva) native non-breeding visitor. 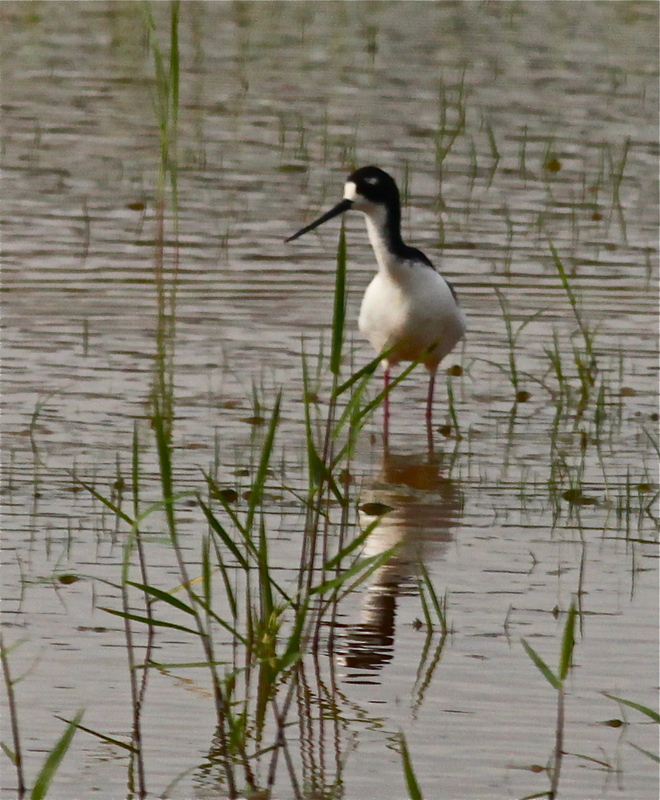 Black-necked Stilt, Hawai'ian Stilt, Ae'o (Himantopus knudseni), native Hawaiian endemic. 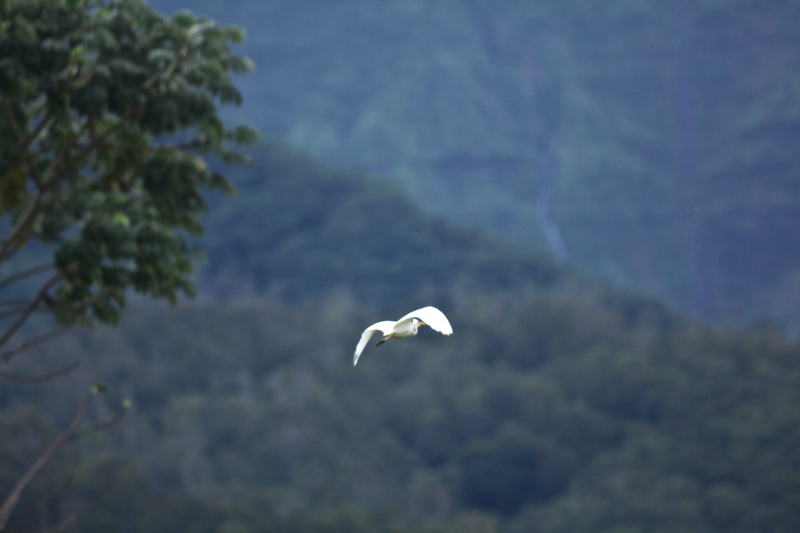 Cattle Egret (Bulbucus ibis), introduced in the late 1950's. 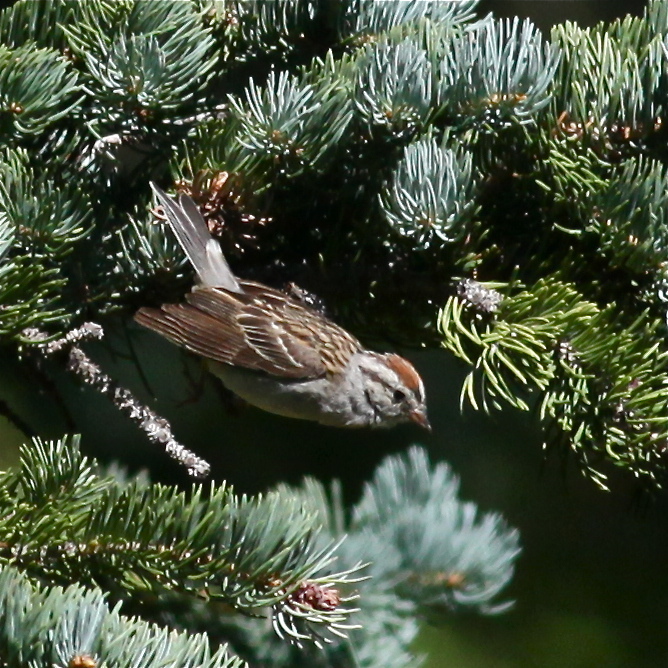 There were wonderful birds in the mountains. 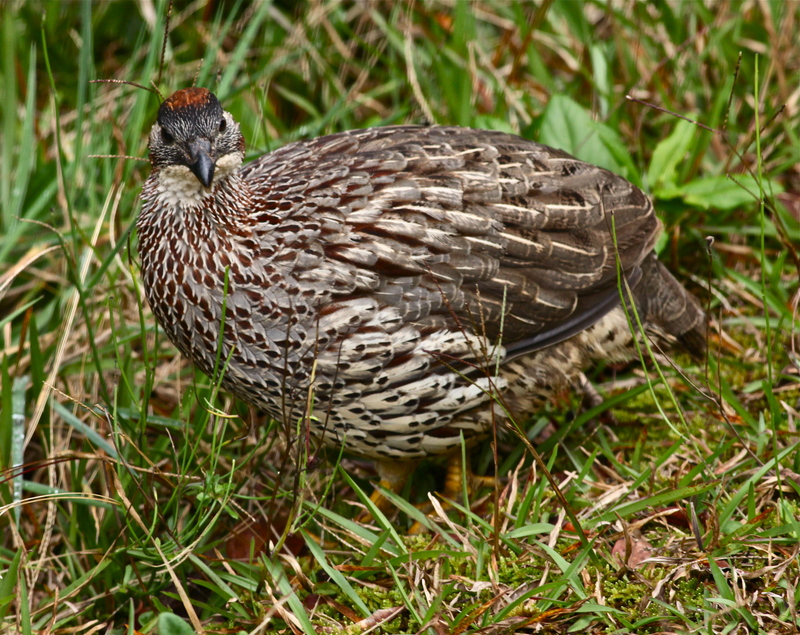 Erckels Francolin (Francolinus erckelii), introduced in the late 1950's, native to East Africa. 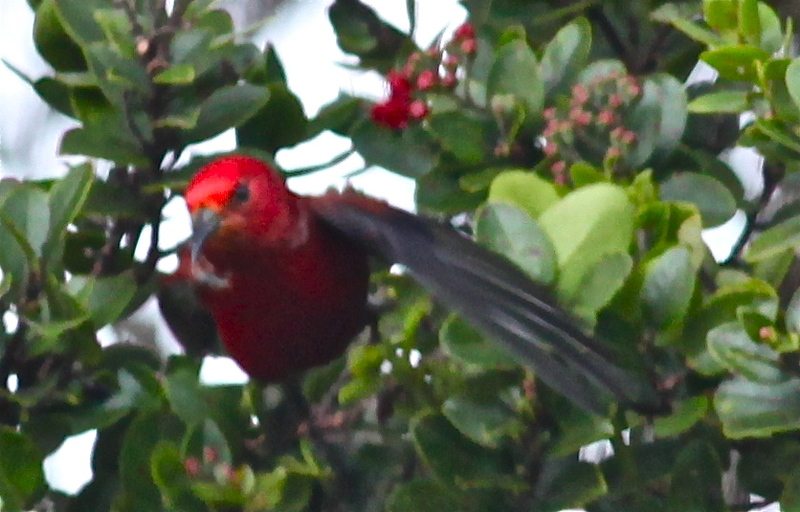 'Apapane (Himatione sanguinea), sipping nectar from`ohia-lehua blossoms. When I drove down the mountains to the coastline near Kekaha, there were acres of sunflowers fields. 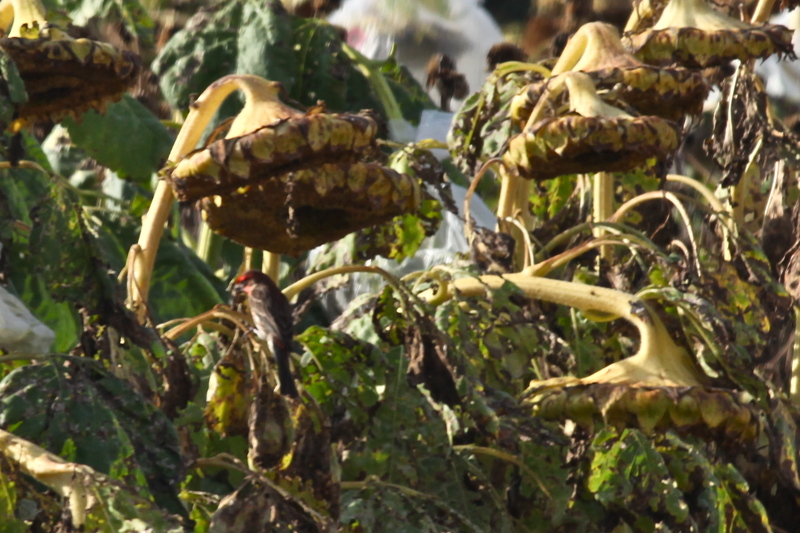 The sunflowers fields were feeding thousands of house finches. House Finch, Papaya Bird (Carpodacus mexicanus), introduced in mid-19th century, native to North America. Perhaps my favorite birds were the seabirds. 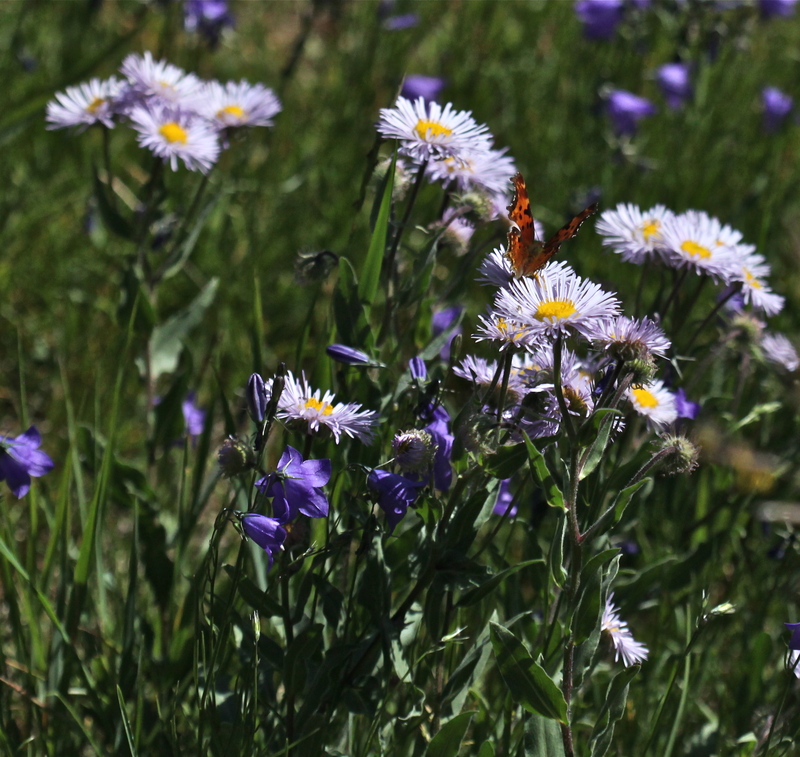 Our trip to Kilauea Point National Wildlife Refuge was memorable. 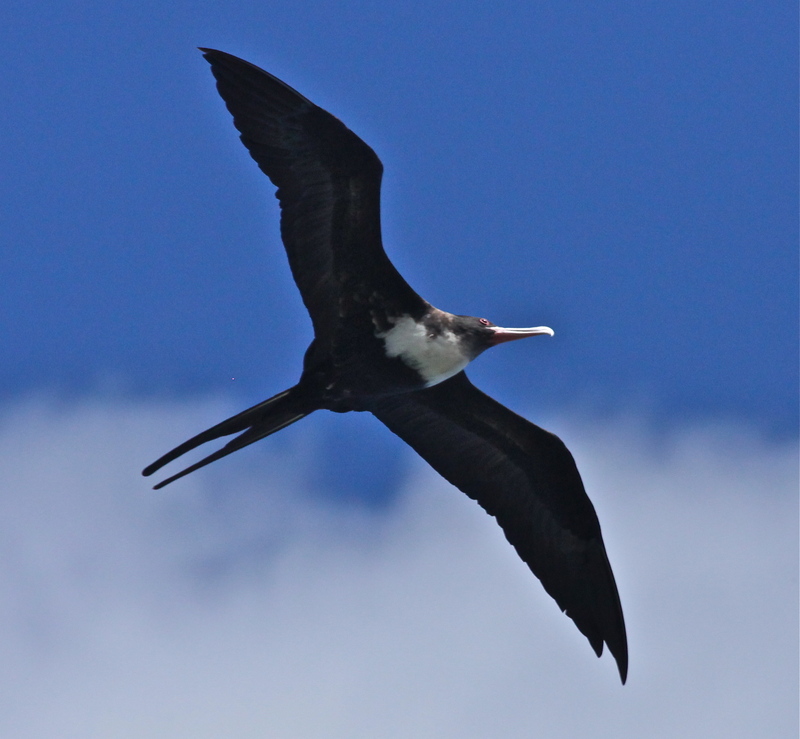 Great Frigatebird, 'Iwa (Fregata minor), native seabird. 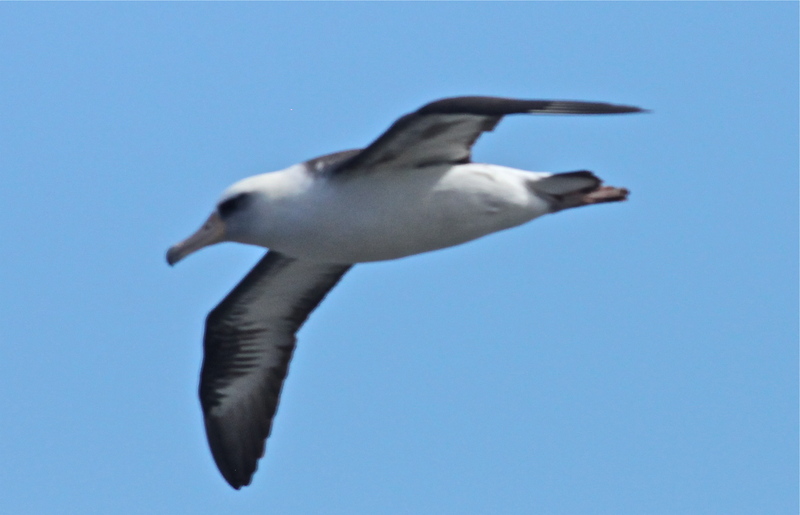 Laysan Albatross, Moli (Phoebastria immutabilis) Native Hawai'ian seabird. 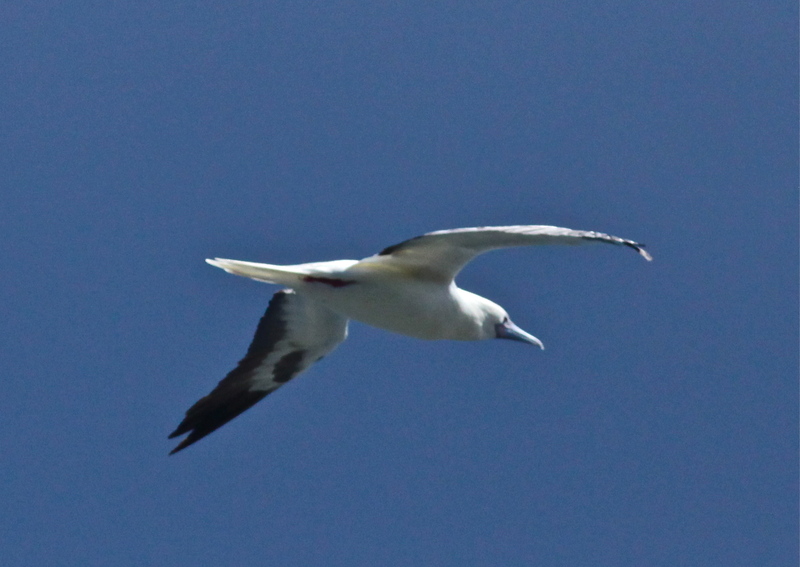 Red-footed Booby, 'A (Sula sula), native Hawai'ian seabird. 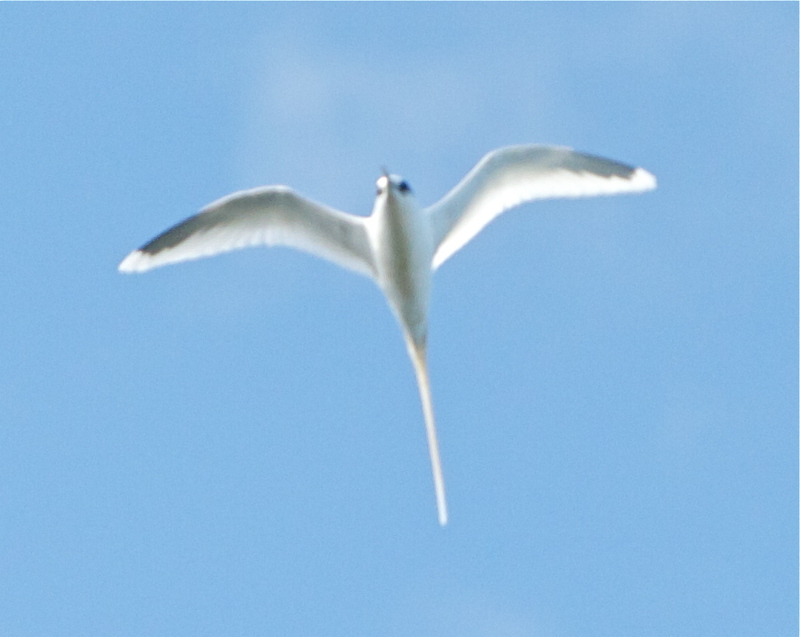 White-tailed Tropicbird, Koa'e Kea (Phaethon lepturus), native Hawai'ian seabird. Rooster in downtown Koloa, Kaua'i. … and in the mountains. 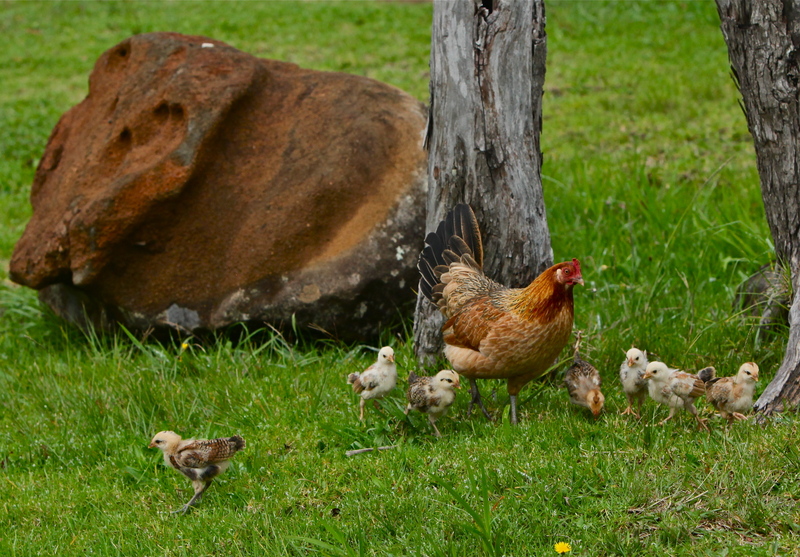 A hen with a large brood at Kalalau Lookout, Koke'e State Park, Kaua'i. 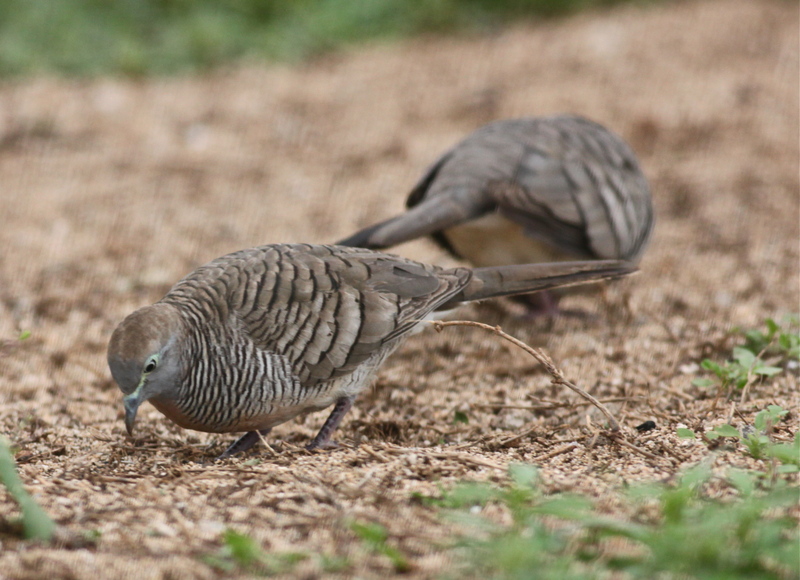 Other birds which I saw but was not able to photograph or neglected to photograph were: Spotted Dove (Steptopelia chinensis), introduced in the 1870’s, native to Southeast Asia; Japanese White-eye (Zosterops japonicus), introduced in the 1930’s from Japan.